Encounter Fiji Youth and Families Trip is a team of 38 people who went to Fiji from the 13-22 July 2013. 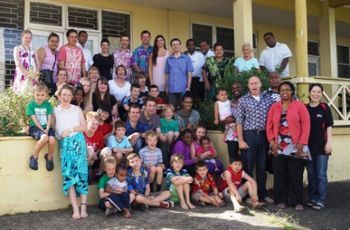 “Many of those going have never been out of NZ, let alone to experience a third-world culture”, says Graeme Mitchell the Team Leader, who has set up this mission using his experience from the first-ever Golden Oldies Mission to Fiji last year. The team comprises of 25 children, youth and students, and 13 parents. The team is from Nelson and Christchurch, and is supported by five churches. So this mission has come to an end, has it been fruitful? Each person will have to decide that for themselves, but lets look at some of the ‘fruit’. A dream to build toilets for 55-years in a remote village, is about to become a reality. With support from the Golden Oldies and this Families Mission, they hope to be completed within the next month. A small church trying to connect with its community had a vision to start a kindergarten. For nearly two-years they have fundraised to build a fence around their church for the children’s protection. They have wanted to open it next year, but needed the final $$$ to finish. This team has made that vision become a reality. Pre-school children will now get the chance to get Christian pre-school education in this town from 2014. A donation given to the Anglican College is being used to start a Scholarship Fund to help village students continue their studies at College level. The children delivered many of the 450 children’s story books we brought with us to schools and villages. A brokerage role occurred with laptops -designed specifically for developing countries, and using e-learning styled education has started between the University of the South Pacific and the Anglican Church for their schools. The confidence gained by the Bible College students who took daily children’s devotions were enjoyed immensely by them. And the heart-warming friendships that have developed between team members and Fijians from each mission site visit will continue to blossom over time.